I'm not sure how Im going to finish it yet. I love the way. Vonna does her ornaments. They're so cute! I might attempt something like that or just do a little pillow. 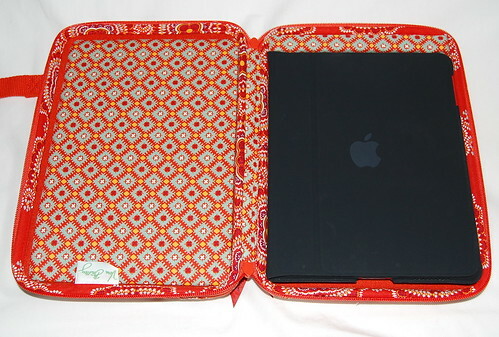 While at Amy's last weekend we stopped by her local Vera Bradley shop and I got a case to carry my iPad and Kindle. It was a great deal at 40% off. When I got home I wasn't sure about the color, but now I'm really liking it. I love your Winter Sheep start! Those colours are gorgeous. I have this chart on my wish list, I really need to order it soon lol. And I love your case for your ipad and kindle, I have a thing about bags myself but haven't seen Vera Bradley stuff here in the UK. Love the new case! The fabric is so gorgeous. Winter Sheep looks really good. I have it kitted up ready to go when I am finished with halloween stitching. Winter Sheep is gonna be adorable...can't wait to see it all duded up! What a great start on your Winter Sheep, love the colors. You take such great pictures! Nice ornament! Love the VB stuff too -- of course! lol! Cute little sheepie ornament. 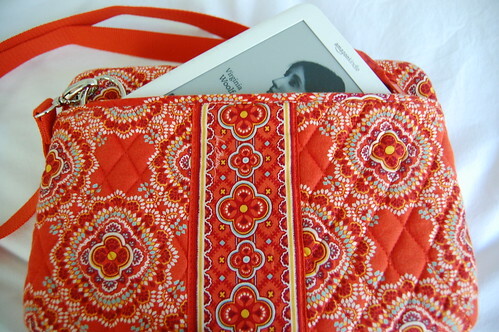 Love your VB case for the iPad and Kindle. Uh oh. I hadn't seen the Winter Sheep! I love your VB case--for a minute there, I thought you were going to say that you had exchanged it! So now it's finding accessories for your gadgets, is it? Only joking! Well done to get this case at 40% off. We don't get VB in Australia (not that I know of) but I'm starting to realise why they're so popular in the States. Good choice on this one, Nicole. Cute start to your Winter Sheep too. Nice to do something small away from Shores for a quicker finish. Have fun with it. Oh, my! I need to get a Vera Bradley case for my iPad! 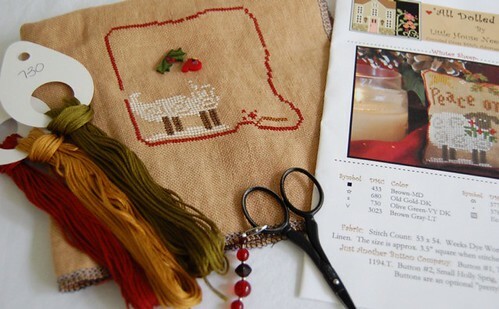 Nice progress on Winter Sheep! Love the bag! I love the color red.